Yummo Mummo | 6 Military jackets you really oughta try this season. 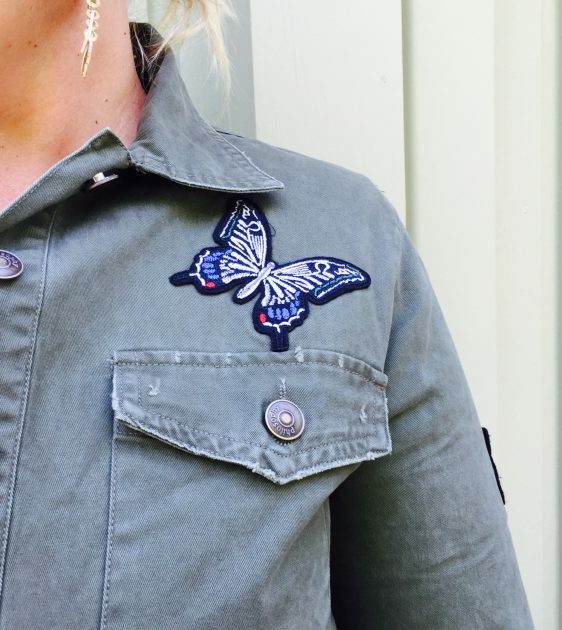 Military jackets – could there be a subliminal meaning behind the trend this season. 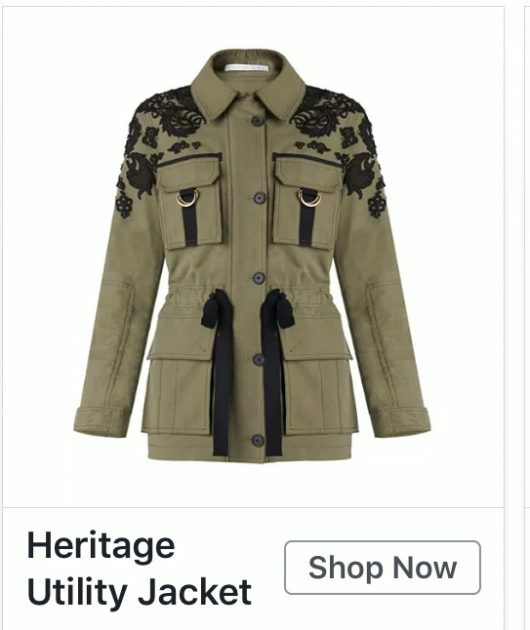 The world’s in a bit of a mess, and military jackets are on the racks. Bejeweled gas masks next? Sorry, but if I didn’t laugh, I’d cry. I wanted to report into you what I have seen in stores and online. 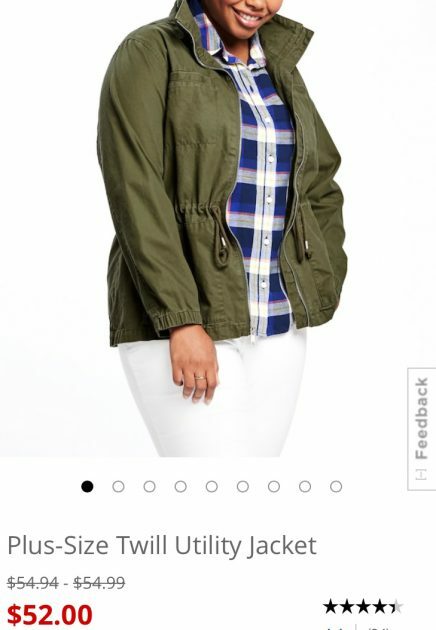 Military jackets add a little edge to your wardrobe, could be considered a staple in my book, and go with oh so many gorgeous prints such as stripes and florals. 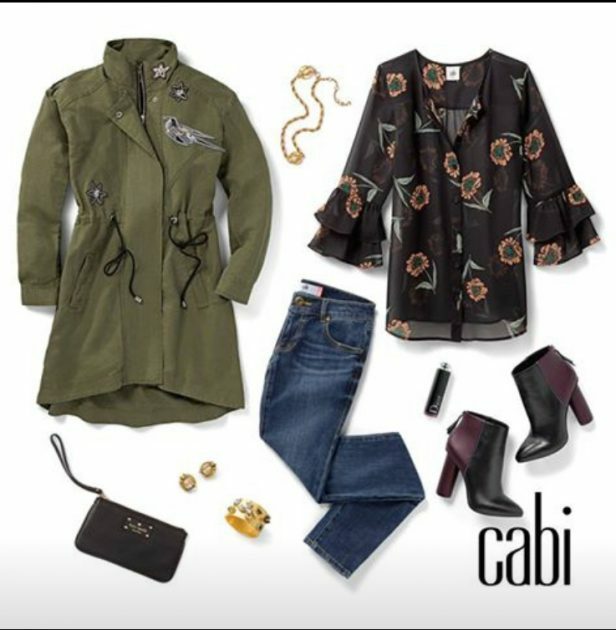 Winter florals are hot on the racks too, so consider upping your style game and trying your hand at these two fun season trends. 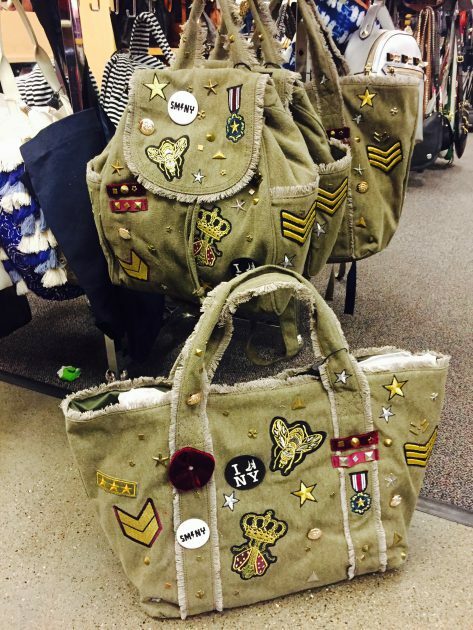 Olive green (aka military green) is earthy and rich as well as it matches with a lot of skin colors. Wardrobe colors to pair it with are black, white, tan, camel, pink, and light or medium gray. I’ve paired a burgundy top in my first outfit, as it continues with that earthy tonality. Oh, and navy blue, love navy blue with olive green. Side note: navy works well with my skin tone in the winter when I have less of a tan. Black in the summer when I have a tan. 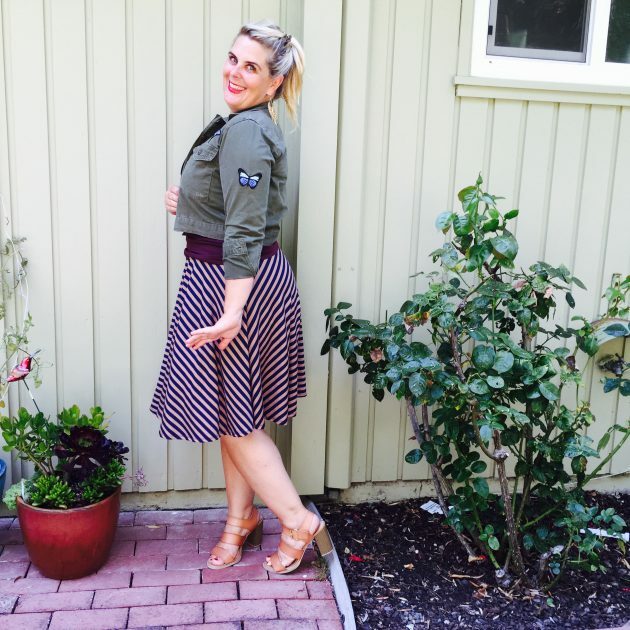 This Philosophy Apparel cropped military jacket is so darn cute, right?? And the embellishments – magnifiique babes! Nordstrom Rack / $24.97 (from $78). The simplest amount of distressing. Wearing M. I think I could have gone up a size, but it wasn’t available in store and and I am a most impatient YummoMummo. Twill Field Jacket in Pine Needle green. Many colors and sizes available. Steve Madden at Nordstrom Rack. $49 (from $98). There is also a cute cross body version HERE which I am quite partial to. I recently worked at a Veronica Beard event and saw this lace appliqué utility jacket. As expected, it sold hot off the racks. 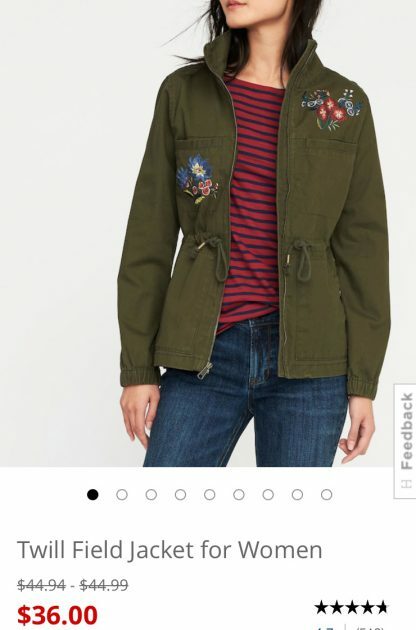 It was just so beautiful in real life and was more tailored that slouchy for a jacket like this. There is a size 2 and a size 4 on final sale at Veronica Beard. From $695 down to $209! I worked with this very jacket at a recent fashion show, and my oh my, I REALLY wanted to take it home with me! More of that great toggle detail to help define the waist. Hanson Anorak $199. 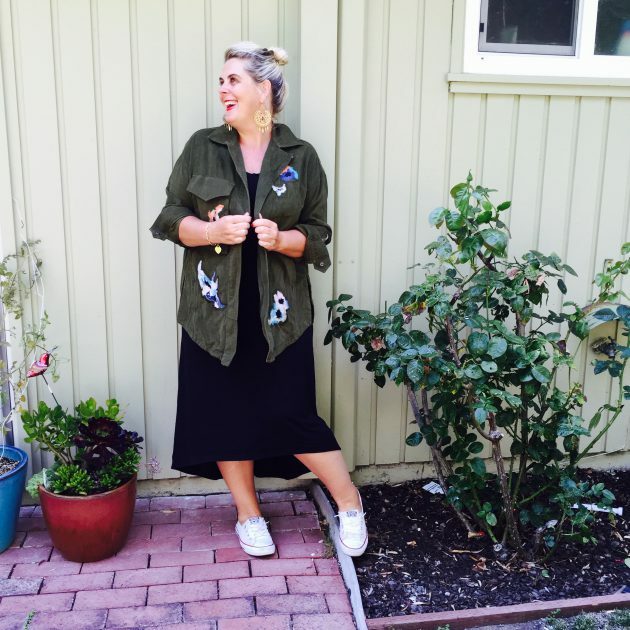 This embroided green jacket is a one size fits most and is designed by a local and very talented designer from the Bay Area Wati Design. Priced at $200. Wati Designs ethos is to align a love of fashion and design with a belief in sustainable living and production. Some designs are her own, and others belong to women designers and entrepreneurs from other parts of the globe, including India, Latin America, Scandinavia and the United States. 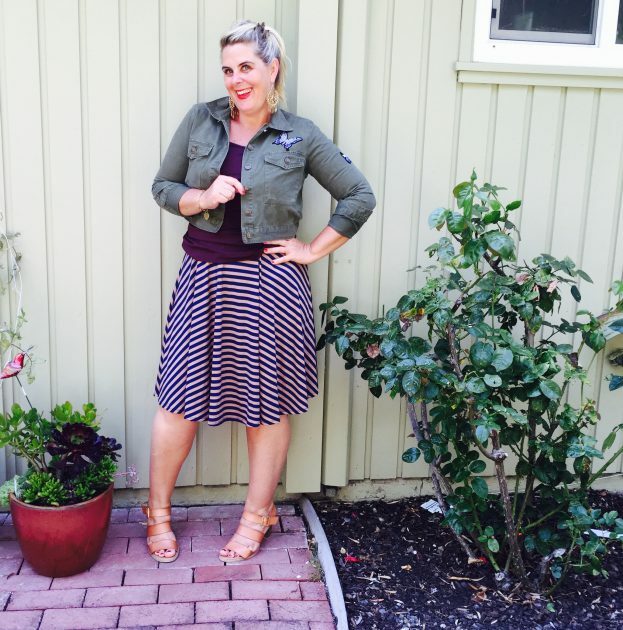 So something for all tastes and budgets, and a little fun inspiration for your wardrobe this Fall. Which one was your favorite?? I can’t decide! « 5 clothing items, 7 outfits. BOOM.